It may be hard to imagine that the best places to see artefacts of the ancient town of Chanhiyun Jo Daro [Chanhu Daro] are along the eastern seaboard of the United States. 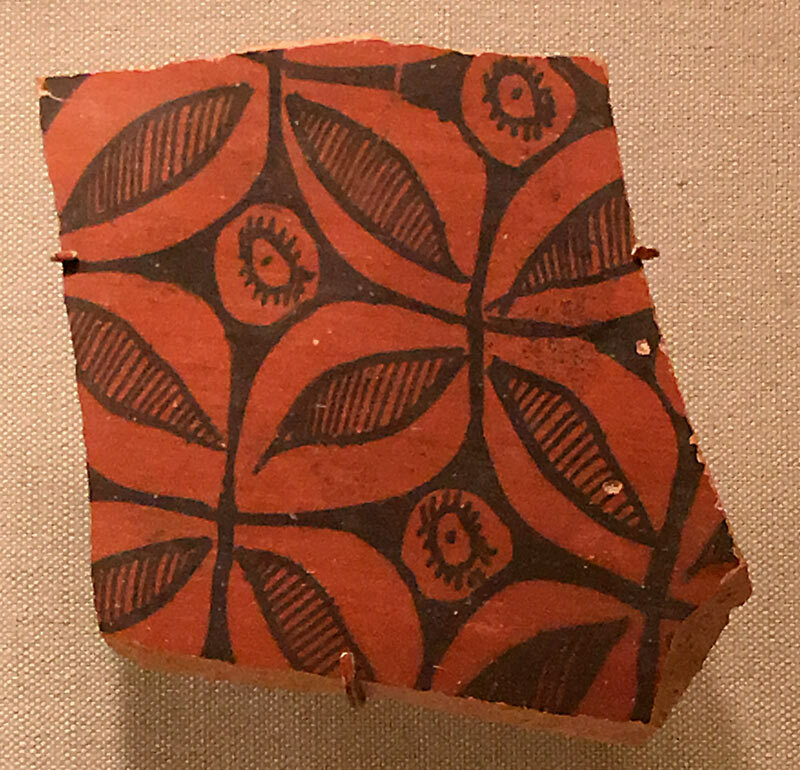 The Museum of Fine Arts in Boston and the Metropolitan Museum of Art in New York have a number of pieces from a US-funded team the worked at the site in 1935-36, led by Mohenjo daro excavator E.J.H. Mackay [see Dorothy Mackay, Finds at Chanhu-daro]. The Museum of Fine Arts in Boston lent some items to the Metropolitan which I was fortunate enough to see in the fall of 2016 [A Visit to the Met I]. It is over 7,000 miles from Chanhiyun jo Daro to the Met, and even in the cold grey cases under sterile light, the pieces retain a certain integrity in their bareness. The vibrant pottery motifs, the exquisite beads, the terra cotta bangles in silent imitation of the finer stoneware kind, baked at an even higher temperature, liquid stone instead of liquid mud – even so, the signs are of a culture that took every care with its crafts and goods, and exemplified its sophistication in its toys, even finer in the case of the rattle than those found at Mohenjo-daro. Ernest J.H. 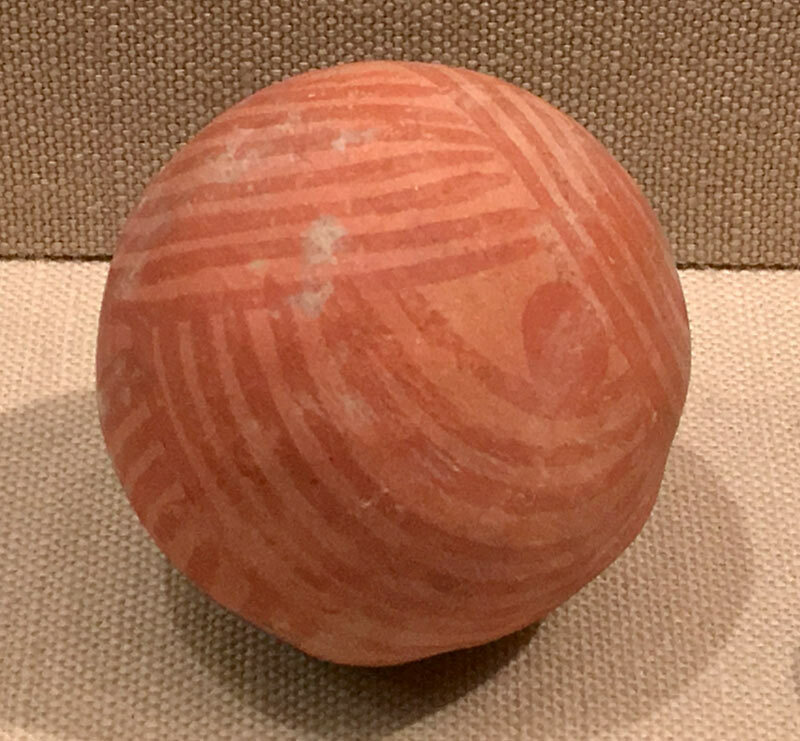 Mackay wrote in Chanhu-Daro Excavations [Image 1] "of rattles, made of pottery and ornamented with lines of red paint. A ver large number were found, especially in the lower levels of Mound II, where they had rolled down from above. Though hollow, they are ver rarely found broken. Similar toys from Mohenjo-daro and Harappa are not so carefully decorated as those from Chanhu-daro; broken specimens from the former site show that they were made by wrapping clay round a combustible core of kind, which disappeared except for a small amount of ash when the rattle was baked. 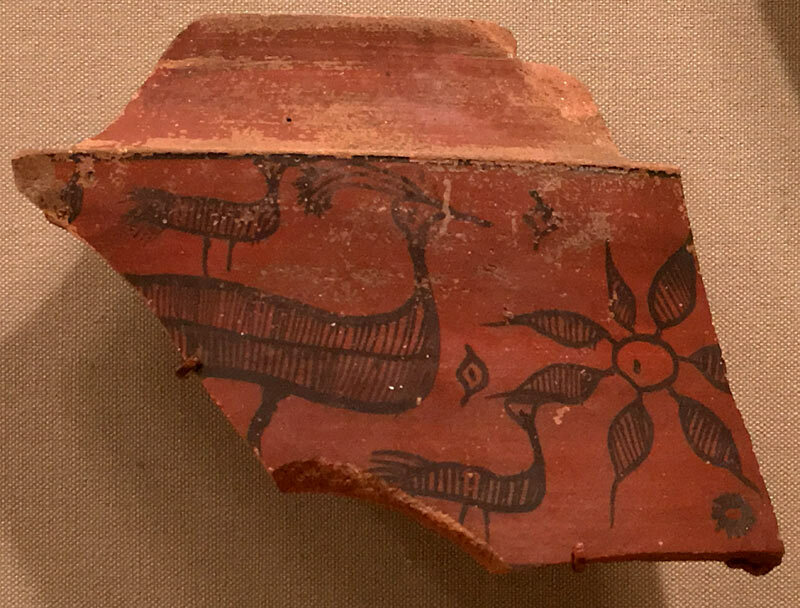 Two or three irregular pellets of clay were found in some of the rattles at Mohenjo-daro and doubtless they exist in those from Chanhu-daro also. A great deal of attention was paid to the decoration of these playthings, though in some cases the paint was applied directly to the pottery's surface without an intervening slip. These rattles ranged in size from an exceptionally small specimen, 0.7 inch in diameter, to 2.5 inches in diameter, with an average of 1.8 inches." (p. 167). These balls still make noise in courtyards across Sindh, Rajasthan, Punjab, Haryana. All these sounds would, if one could hear them all at once, amount to a soundtrack that has barely changed in pitch, reason or the cries of delight it provokes. 2. 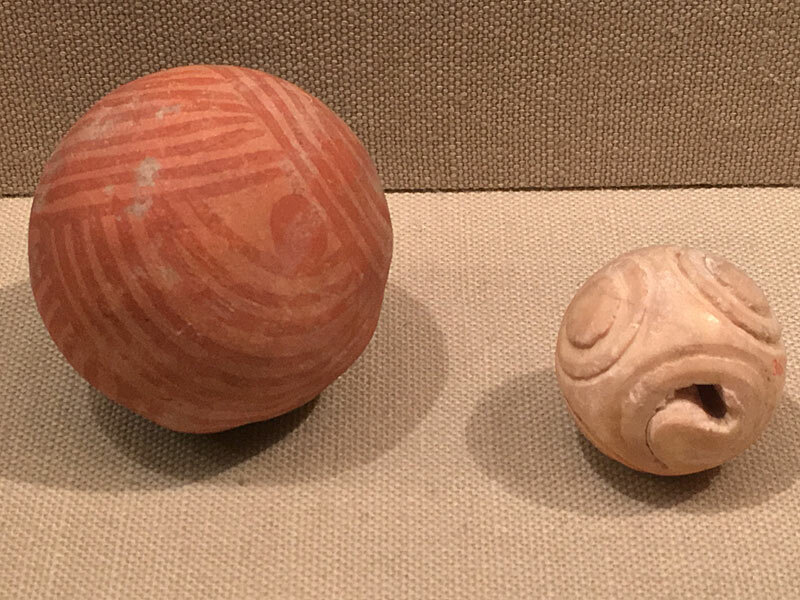 Ball and rattle, Chanhu Daro, 2600-1900 B.C. 4. 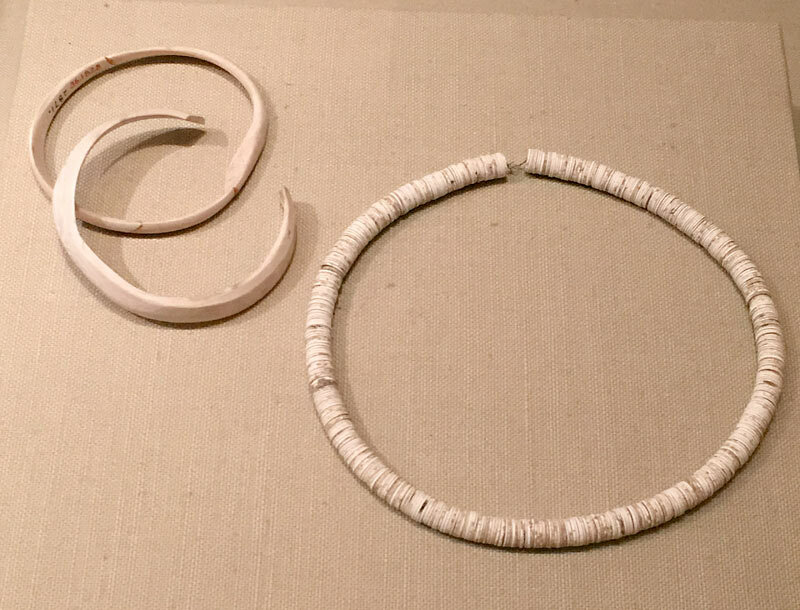 Necklace of disc-shaped beads, Chanhu Daro, Steatite (modern recreation), and bangles. It resembles a necklace from the chest of an adult excavated at Mohenjo-daro.